314 votes. That’s it. Rep. Mike Smiddy won re-election in 2014 by only 314 votes. In November 2013, when Rep. Smiddy–who hails from tiny Hillsdale (population 588)–was a freshman legislator in the Illinois House, he voted for marriage equality. In a western Illinois district where the consequences of his courageous vote were unclear, he stood up for our community. When marriage equality passed the Illinois House by just one vote, it became clear that Rep. Smiddy’s vote was essential to ensuring the freedom to marry in Illinois. In 2014, he almost didn’t get re-elected. 314 votes were all that stood between the LGBTQ community having a champion of our equality in the 71st District and an uncertain future for us in the General Assembly. In a time when the stakes for our country are so high, it can be easy to focus on the critical national races. But right now, there are over 1,900 people running for public office in Illinois. They are seeking out roles that will govern every aspect of our lives: how we are treated in schools, what services our most vulnerable community members have access to, how sustainable our future will be. Some of these candidates see our move toward equality as a threat and will work hard to cut back on our hard-fought victories. They want to introduce legislation that will stigmatize our transgender children in school or legalize discrimination against LGBTQ people. And others, like Rep. Mike Smiddy, are working tirelessly to support our community to move to the full equality and acceptance we deserve. Election Day is November 8. I ask you to stand up for LGBTQ equality and vote, whether that be this week at Early Vote Stations or on Election Day. And don’t just vote for the candidate you support for President or U.S. Senate, but vote for every candidate in your community who is willing to champion the LGBTQ community. 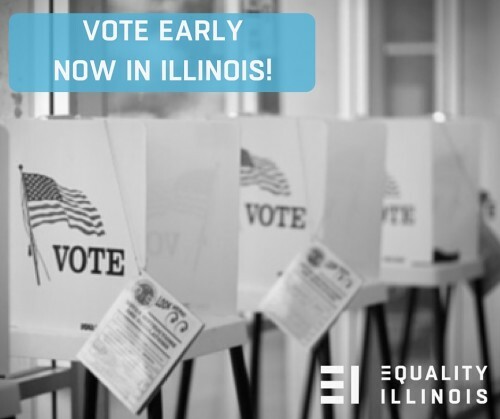 If you are unsure whom to support, check out the list of pro-LGBTQ candidates the Equality Illinois PAC has endorsed. Show our state that when elected officials stand up for our community – and candidates publicly support our community – we stand with them in solidarity!